Immediately cease all deduction of pensions and salaries and return all benefits and backpay due to the seven SRUT leaders, following their unfair dismissal. Take action here to add your message of support for the SRUT leaders from Thailand. The State Railway Workers' Union of Thailand (SRUT) organised a nationwide rail safety campaign following the fatal train derailment on 5 October 2009 at Khao Tao Station in Thailand, which killed seven and left several others injured. An internal fact-finding investigation concluded that the main cause of this accident was that the locomotive was poorly maintained and in an unsafe condition. The criminal court dismissed and imprisoned the train driver on the grounds that he operated the unsafe locomotive. On this basis, the civil court ordered the State Railway of Thailand (SRT) and the driver to pay damages to the families of those affected. The National Human Rights Commission of Thailand also concluded that the unsafe condition of the locomotive was the main cause of the accident. Following the official complaints of the ITF and ITUC, the ILO sent its conclusions and recommendations to the Thai government. 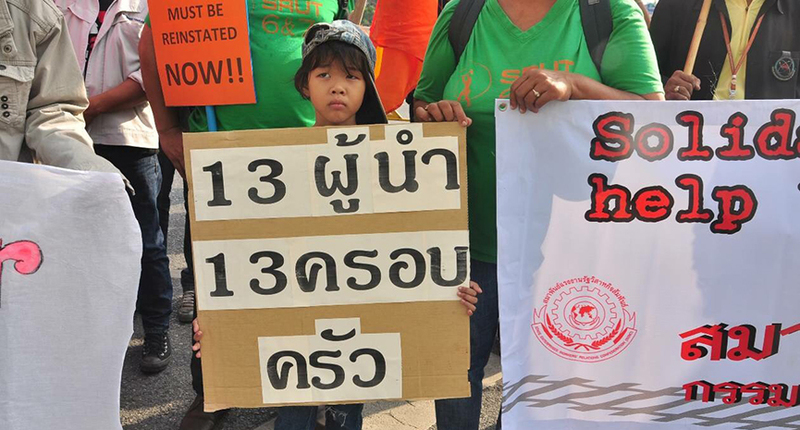 These findings clearly show that the only fault of SRUT's leaders was to rightly highlight the unsafe working conditions on the Thai railway system. However, the SRT dismissed six leaders of SRUT Hat Yai branch in 2009; filed cases against seven SRUT national leaders and dismissed a further seven in 2011. These unfair dismissals led to the campaigns at both national and international level demanding the reinstatement of all SRUT leaders. In 2014, 13 leaders were reinstated to their positions, but only six of them with their back pay. In March 2018, the Supreme Labour Court ordered seven SRUT leaders to pay damages currently amounting to approximately 24 million Thai Baht (approximately USD 726,116). This immense fine would take them at least 10 years to pay off and cripple the lives and futures of themselves and their families. Share this page and spread the word with your friends and contacts on social media.